Although Let It Be was the final studio album that the Beatles released, Abbey Road was the last of their albums in which John, Paul, George, and Ringo participated in. In fact, most of the Let It Be tracks were recorded prior to the Abbey Road sessions. Abbey Road was an immediate commercial success with chart topping songs like ‘Something’ and ‘Here Comes The Sun’. Not only does this album contain Ringo’s lone cataloged drum solo but a majority of the B side consists of a well crafted 16-minute medley of incomplete songs; in different keys, different styles, and all written by different composers. When assembling a rough mix of the medley, ‘Her Majesty’ was originally tucked in between ‘Mean Mr. Mustard’ and ‘Polythene Pam’. Paul decided that he didn’t like the song and had it removed. Abbey Road engineer, John Kurlander, having been told never to throw anything away, stuck ‘Her Majesty’ 20 seconds after ‘The End’ and an acetate was made from that tape. Paul heard it and realized he liked the way it worked in that context, and it remained on the album. Until Apple Records caught on to this change, ‘Her Majesty’ was missing on the track listing and ended up as a hidden track on initial Abbey Road issues. Not only did this make things interesting for Beatles fans but for vinyl collectors as well. 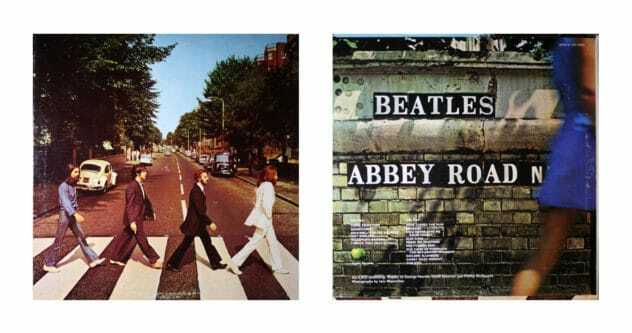 Beatles historian, Bruce Spizer, provided some commentary about the jacket variants of the first three US issues of Abbey Road in his book, Beatles on Apple Records. Let’s take a look into why ‘Her Majesty’ did or did not make it onto the track listing of your copy of Abbey Road. Prior to the release of Abbey Road, The Beatles album covers were constructed by pasting separately printed slicks to stock cardboard jackets. A process that required both a print shop and a jacket fabricator. On October 1, 1969, Abbey Road became the first Beatles release, in America, introduced with printed covers. These covers involved the process of printing the album artwork directly onto white cardboard, which was then folded and glued to form the album jacket. The advantages of this new process cut costs and reduced production times for the label. The first batch of covers does not list ‘Her Majesty’ on the rear cover track listing. The front cover has more of the crosswalk at the bottom edge of the cover and includes a portion of a square, metal access panel positioned on the bottom edge of the cover, beneath Ringo and John’s feet. Prior to the album going on sale, Capitol had the film for the rear cover revised to list the song ‘Her Majesty’ after ‘The End’. By the time the new artwork was sent out on September 24, many covers had been printed. Thus, the second batch of jacket covers listing ‘Her Majesty’ are less common and rarer than the jackets not listing the song. The front cover image has the exact characteristics of Cover #1 (more of the crosswalk at the bottom edge of the cover, and includes a portion of the square, metal access panel positioned on the bottom edge of the cover, beneath Ringo and John’s feet). 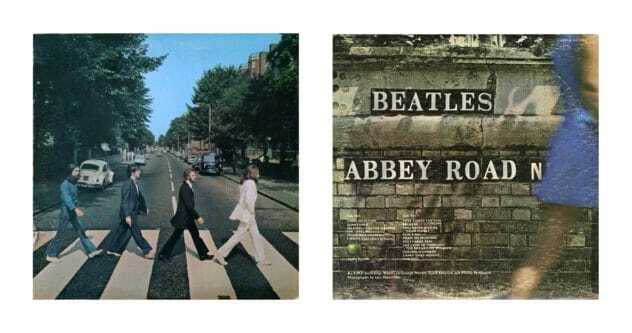 Abbey Road ended up being the only Beatles album to have printed covers upon initial release. Although Capitol was pleased with the printed jackets, future decisions regarding the mastering, packaging, and advertising of Apple releases were handled directly by Apple. Under the influence of very loyal individuals who had a long-standing relationship with Queens Litho, they selected them again to be the primary printer of cover slicks for future Beatles albums starting with Hey Jude. When Capitol’s pressing plants ran out of the printed covers, Apple hired Queens Litho to print slicks for additional Abbey Road jackets. This third and final batch of covers used slicks printed by Queens Litho and Bert-Co. The rear cover slicks were made from the album’s original artwork and accordingly, do not list ‘Her Majesty’ on the rear cover. The front cover image was enlarged to allow for the front slick to be wrapped around to the back cover. 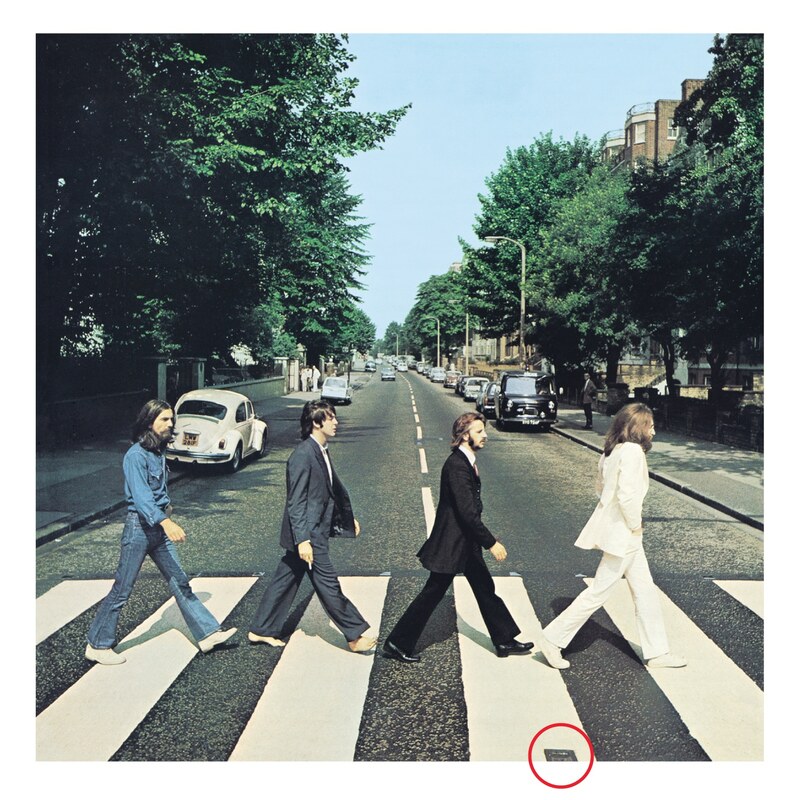 Thus, the picture on the front shows less of the trees and crosswalk (the square, metal access panel in the road is missing), and has a larger image of George, Paul, Ringo, and John. In the vinyl community, differences between disc labels, pressing plants, or master tapes usually provide us with nuance information about our favorite records that can’t be found on the jacket or within the liner notes. Yet one of the most iconic covers in the history of recorded music has a back story seldom seen.